Companies must evaluate whether they can use new technology and communication channels to improve recruitment. Learn how artificial intelligence, automation tools, and shifts in communication impact how companies hire new employees. Technology gives us new opportunities to communicate in an always-on world – and as hiring managers and candidates get to know one another through applications, interviews, and negotiations, technology and shifts in communication are changing the way job seekers find work. Today’s candidates and companies use new channels of communication as well as technology such as artificial intelligence (AI) and automation to aid in the recruiting process. We surveyed 507 people who started a new job within the past six months to discover how technology impacts the way job seekers communicate with companies. Hiring managers can use this report to keep pace with current communication trends during recruitment and to learn about upcoming technology. Phone calls and email are still essential to hiring. Nearly three-quarters of recent hires connect with companies via phone calls (74%) and email (73%) during the hiring process. Nearly one-quarter of job seekers (24%) use texting to communicate with a company during the interview process. Nearly 1 in 5 job seekers (16%) use social media to connect with companies. Only 3% of applicants communicate with companies via chatbots, but experts see potential for chatbots to become more popular. 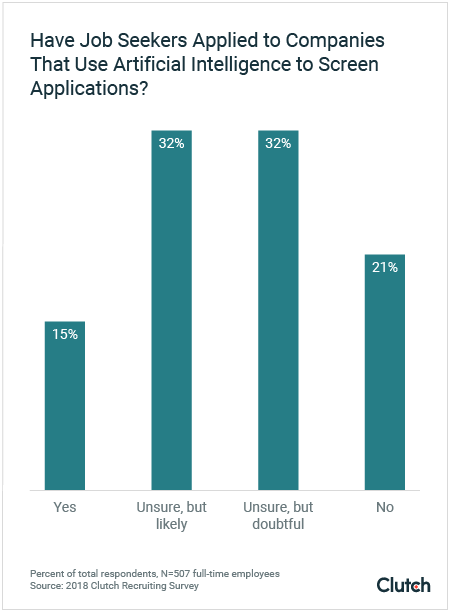 More than half of recent job seekers (51%) believe AI isn’t advanced enough to assist with the recruiting process yet – including 19% who doubt AI will ever be helpful in the future. Among those who view AI positively, around one-quarter of people (26%) believe AI can help with some recruiting tasks, while only 11% of people say AI improves the recruiting process overall. Job seekers often have no way of knowing whether companies use AI to evaluate their candidacy. An equal percentage doubt (32%) and suspect (32%) that companies used AI to evaluate their resumes or cover letters. More than 1 in 10 recent hires (15%) know that AI was used in their application process either because the company told them that this occurred or because they now work there. Phone calls and emails are still essential to hiring. Three-quarters of recent hires connected with companies via phone calls (74%) and email (73%) during the hiring process. Job seekers who live too far away to conveniently schedule an in-person interview also used video calls (11%) to connect with potential employers. Although these channels are still the most common forms of communication, they are not the only options job seekers and hiring managers use to connect. Today, many job seekers and recruiters embrace text messaging. For candidates and companies alike, texting provides an opportunity to touch base in between formal steps in the recruitment process. When Laurelei Litke interviewed for her current role as a digital marketing content creator at HealthLabs.com, she occasionally texted an HR representative because her schedule didn’t leave much time for calls or emails during the work day. “I texted ahead once to let her know that I was going to be late, due to an agency meeting that was running long,” Litke said. Litke received immediate reassurance that she should take her time and drive carefully. Litke was impressed: “Small gestures like texting when it was more convenient for me made me feel valued and excited to be a part of their team,” she said. Companies can use texting to keep candidates “warm,” an industry term for providing frequent updates that keep candidates engaged and enthusiastic about the possibility of a job offer. Some recruiters use texting to keep in touch with candidates about future opportunities. Companies can use texting to keep candidates in their recruitment pipeline, even when things don’t work out. Courteney Kovacs, a senior professional in HR at Hudson Insurance Group, views texting as a valuable tool for communicating with potential employees. Kovacs primarily texts candidates who already have engaged with Hudson Insurance Group, typically to send a quick update or handle logistical details, such as confirming an interview time. Texting provides a quick, easy way for companies to keep in touch with candidates. As texting becomes a more common avenue of communication during recruiting, experts say it should be treated as a quicker version of email, with similar professional standards. Texting is an increasingly important tool recruiters can use to touch base with candidates. More than 70% of companies today maintain a presence on social media, with Facebook, Instagram, and YouTube the 3 most popular channels. For job seekers, a company’s social media presence offers both insight into what life at the company might be like as well as an opportunity to connect. Nearly 1 in 5 job seekers (16%) use social media to connect with companies. LinkedIn, a social media platform designed for professional interactions, is likely the source of many of these connections. 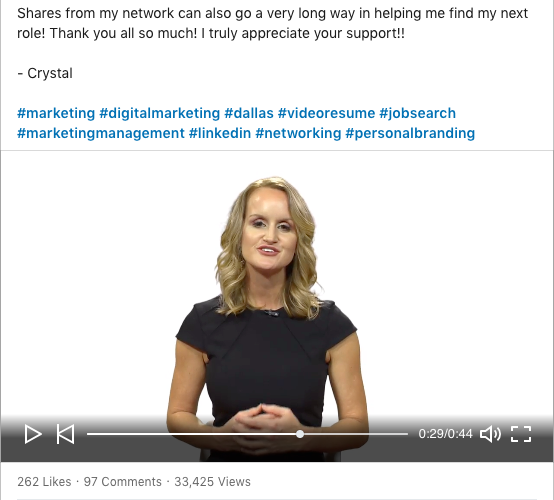 When Crystal McFerran began a new job search for a digital marketing role, she shared a short, 45-second video on LinkedIn that summarized her goals and experience. After McFerran posted the video, it had more than 30,000 views. She ended up receiving 6 job offers and ultimately accepted her current role as senior vice president of channel marketing at The 20. Although most candidates aren’t likely to replicate McFerran’s viral success, her experience provides an extreme example of the way LinkedIn can lead to new connections that later develop into professional opportunities. LinkedIn isn’t the only channel used for recruitment, however. Candidates and companies also connect on Twitter, Instagram, and other platforms. David Vallance initially connected with his current employer, LeaseFetcher, on Twitter. “It turned out, the founder was still handling the social media, so I had actually been having a super informal chat with the person who would be making the hiring decision,” Vallance said. Some hiring managers welcome social media connections with potential employees. Emily Rowe is the owner and CEO of Social Sensei, a Florida-based creative agency. She initially connected with three members of her core staff on Instagram before she hired them. “We’ve ultimately learned that if an individual or business is on social media, they should expect to use it as a main mode of communication,” Rowe said. Social media communication may be more common for companies such as Rowe’s that maintain an active and engaged presence on social media. In more traditional fields where digital marketing is not a daily activity, such as legal or financial services, social media communication may be less successful. Companies and candidates who use social media should still uphold professional communication standards, despite the intimate and casual communication style that is common on social media. Chatbots are becoming a more common website feature, and they can provide value for recruiters and HR professionals. Chatbots are computer programs that businesses build on company-established rules, such as responding to a certain type of query with repurposed copy from an FAQ page. Users typically interact with chatbots via an instant messaging window that pops up on a company’s website. Only 3% of applicants use chatbots to communicate with companies, but experts see a lot of potential for this number to grow. Customer Service: Unlike human workers, chatbots can be available to answer questions and provide assistance 24 hours a day, seven days a week. Screening Candidates: Chatbots can collect candidates’ responses to screening questions, gathering information that recruiters can review before reaching out to candidates. Customer service might seem unrelated to recruitment – until you consider that 91% of job seekers say the interview process impacts their overall opinion of a company. When candidates have a question or run into an obstacle while filling out their application, your company should treat them no differently than a customer who wants to purchase a product. Although chatbots might initially seem less personal, some believe that people are more willing to talk to a chatbot in some cases. Chatbots can also provide quick responses outside of normal business hours. Brent Mitchell is a career consultant at Keller Williams. He created a chatbot called Willie (after co-founder Joe Williams) to assist aspiring real estate agents. 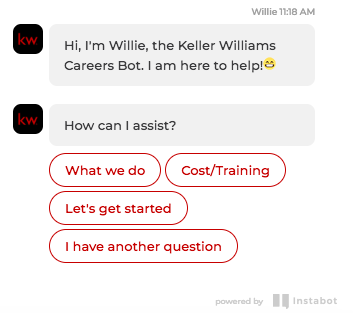 Although Willie guides users toward common questions, it also handles random questions users might be too embarrassed to ask. “If there’s a real person on the other end, they might think their question is stupid or silly,” Mitchell said. Instead, users are free to ask Willie anything they’d like. Mitchell’s goal isn’t solely to provide great customer service. Willie also boosts his own productivity by helping to screen candidates. Before scheduling an interview with a potential real estate agent, Mitchell can review the user’s conversations with Willie to determine if they are qualified. For example, he does not schedule interviews with people who do not have a real estate license or who are only looking for part-time work. Chatbots can help recruiters save time by capturing important screening information. Ensure your chatbot can capture leads, including a user’s email and contact information. Consider how your chatbot will integrate with your existing contact management system (CMS). Create content – both for your chatbot’s responses and pages on your website – that anticipates and answers users’ questions. Although chatbots aren’t common yet, they can provide value in the recruitment process. Although AI is a hot topic in the world of recruiting technology, job seekers aren’t always enthusiastic about it. 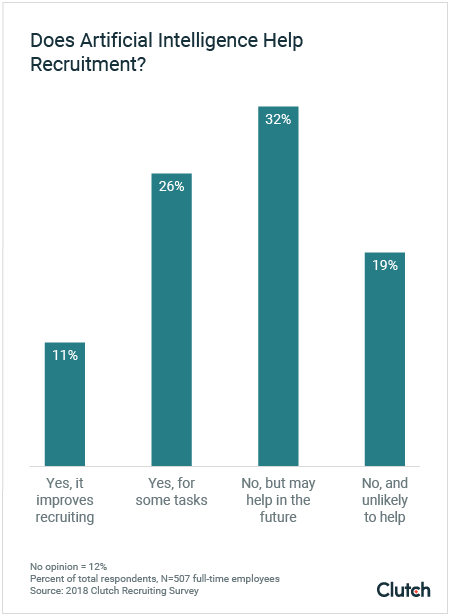 Around one-quarter of people (26%) believe AI can help with some recruiting tasks, while only 11% of people say AI improves the recruiting process overall. Job seekers aren’t entirely wrong to distrust AI. In October 2018, Reuters reported that Amazon discontinued use of its AI recruiting tool when it realized the tool displayed bias against women who applied to work at the company. Companies must provide data that trains a new AI system. Amazon's AI recruiting tool initially relied on resumes of employees who were hired over the past decade. Because this pool of hires skewed male, the company inadvertently taught its AI that male applicants were preferable. If an application came from a women’s college or contained keywords such as “women’s chess captain,” the AI docked points. More than half of HR professionals, however, expect AI to become a fixture in the hiring process in the future. A 2017 survey by CareerBuilder found that 55% of HR managers expect AI to be part of the hiring process within the next 5 years. 55% of HR managers expect AI to be part of recruitment within 5 years. It automates repetitive tasks to free up time. It reveals and leverages data in recruiting. These two factors reduce the time and cost of recruiting. Recruiting is all about communication – and highly responsive communication requires countless emails as recruiters and hiring managers confirm, schedule, and gather information throughout the interview and hiring processes. Automated communication can also help prevent your company from inadvertently ghosting candidates. Keeping in touch with dozens of candidates will always be challenging, but automation can help reduce the burden on companies and recruiters. Companies can also improve employee recruitment and retention by capturing and leveraging data. As recruitment becomes more data-driven, AI can help recruiters track metrics such as how a candidate’s skills can predict his or her success on the job. Ketan Kapoor is CEO and co-founder of Mettl, an HR technology company and talent measurement firm. He believes that AI tools are capable of capturing valuable data companies can use to improve their recruiting practices. “AI is going to redefine the way recruitment is conducted across organizations, and HR managers will be able to derive ‘never-done-before’ insights from the recruitment cycle to make faster, better, and smarter hiring decisions,” Kapoor said. Mettl offers a hiring platform called HireTRACK that is built, in part, on AI. It automates portions of the hiring process and provides access to data. When companies notice problems, such as candidates with a certain skill deficiency underperforming in a role, they can make informed adjustments. Recruiters and hiring managers can identify patterns and solve problems in the hiring process by gathering and analyzing data. It may be impossible for job seekers to know if companies used AI in the hiring process. More than half of job seekers (64%) are unsure if companies used AI to evaluate their resume or cover letter during their interview process. Only 15% of people have confirmed that businesses used AI to recruit them because the company disclosed it or they now work there and have insight into hiring practices. Harj Taggar moved from London to Silicon Valley in 2007, the same year a company he founded received funding from Y Combinator, a Silicon Valley company that provides seed funding for new startups. In the years that followed, Taggar joined Y Combinator as its first full-time hire. As Taggar worked with the big-name startups that filtered through Silicon Valley, he became increasingly concerned that they tended to attract a homogenous pool of talent from a small set of universities. Companies risk reinforcing flaws in their existing recruitment when they use AI to scan traditional application materials, such as resumes and cover letters, for keywords. When AI reinforces a lack of diversity, companies may suffer financially. Companies that hire a diverse group of employees are statistically more likely to achieve higher profits. Instead, companies should apply AI to skills-based testing, which promises to increase diversity by reducing bias in recruiting. Some experts even advocate for using AI-aided skills-based testing instead of evaluating resumes or cover letters, which can invite biased assumptions about candidates who fall outside common backgrounds. Haggar shares this belief. His company, Triplebyte, recruits candidates for technical roles by starting with a skill assessment and ignoring their educational background and personal biography. “As long as your test isn’t easier for someone who went to MIT to pass than it is for someone who went to a community college, then AI can be tremendously helpful because it allows you to screen lots of these people quickly and efficiently and identify all those people who are good, who don’t have a traditional background,” Haggar said. This approach has the potential to benefit both companies and candidates. Companies that compete for the same small pool of candidates can discover new talent by doing background-blind, skills-based recruiting. Candidates who fall outside the background companies typically recruit from benefit when the recruitment process emphasizes their skills and abilities over race, gender, education, and other factors. Although AI may reinforce bias when used to evaluate keywords in resumes or cover letters, it can identify and leverage new talent pools when used to evaluate skill-based testing. Most job searches today still involve communication, logistics, and skill assessments. The channels companies and candidates use to interact, however, are changing. 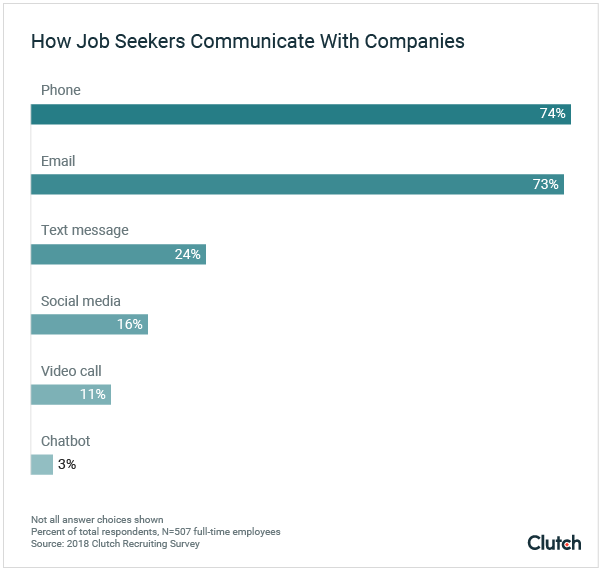 Although phone calls and emails are still the most popular communication channels during recruitment, some job seekers and companies now connect via text or social media. Chatbots aren’t common yet but may become more popular with time. Most job seekers are uncertain if companies have used AI to evaluate their resumes and cover letters – and whether AI can provide value in recruitment, now or in the future. Experts recommend that companies use AI tools to evaluate skills-based testing instead. This approach can reduce bias while using data to match candidates with roles in which they are likely to succeed. Companies should always prioritize transparent, honest communication with potential employees as they adapt to changing communication norms and technology. Clutch surveyed 507 full-time employees who started a new job within the past 6 months. Respondents work in a variety of settings, including large businesses with more than 500 employees (35%), medium-sized businesses with 250-500 employees (20%), small businesses with fewer than 250 employees (19%), startups with fewer than 100 employees (17%), and miscellaneous other businesses (9%).